Budapest is a city equally recognized for its culture, cuisine and vibrant nightlife. This means you’ll be able to dine at mouthwatering restaurants, soak in hot baths, dance the night away at ruin bars or explore the city’s gorgeous surroundings. No matter your preferences though, Budapest is sure to impress. Here’s a quickfire guide to the city’s best attractions, foods and more. Go for a spot of fine dining at the literary KönyvBár & Restaurant, here seen serving up delicious dishes in the vein of Harry Potter and the Prisoner of Azkaban. All photos by the author. For authentic, hearty Hungarian grub, the Hungarikum Bisztró located near the Danube is your best bet. Here you’ll feel like you’re dining in a Hungarian family’s home; invited to pull up a chair and indulge in a tasty bowl of gulyás – a traditional thick beef soup cooked with paprika and vegetables. As for a fine-dining experience, I simply can’t recommend KönyvBár & Restaurant highly enough. Their menu is always themed around a particular novel and changes every few weeks. Meals aren’t cheap, but the dining experience is absolutely magical. Additionally, Könyv use Hungarian produce and traditions to conjure up their literary feasts, making this is a must-visit for all foodies with money to spare. Do like the locals, have a bite of lángos. When it comes to Hungarian street food, there’s nothing better than a massive, hot lángos – basically a giant, deep-fried flatbread slathered with either savoury or sweet toppings. To fit in, go for the traditional sour cream and cheese toppings. Tomi Lángos, my regular lángos hangout, serves up its delicacies through a tiny, slightly suspicious sliding window in its storefront. 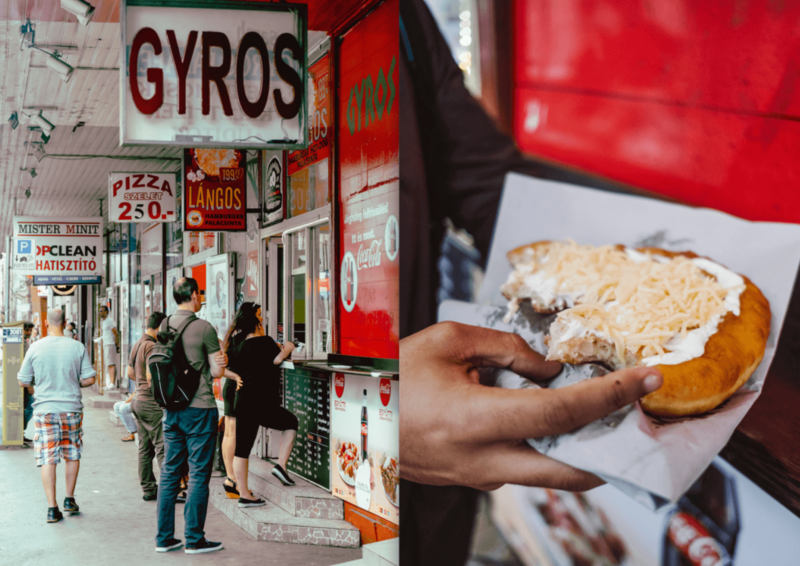 Having a meal here might feel a tad like going through passport control at the airport, but with lángos going for just around 300 – 600 forints (1−2 pounds/​euros) it’s the cheapest grub around. For even more delicious carbs, make sure to try a traditional ​‘Chimney Cake’. This hot street food is served from food stands just about everywhere and is made of thin, crispy dough coated in sugar, which becomes caramelised and crunchy once cooked over a fire. You’d be crazy to not visit one of Budapest’s many thermal baths and spas. Although the biggest and most famous of them is the Szechenyi Baths, I would recommend trying Gellért Baths instead. Not only do they attract slightly fewer tourists, I find them more beautiful. Case and point: it was the Gellért Baths that inspired Wes Anderson’s masterpiece, The Grand Budapest Hotel. Go early in the morning to avoid tourists, but expect to soak alongside the (much older) locals. Many locals also prefer going to Rudas Baths as they’re cheaper but provide a very similar experience. Ice-skating next to the breathtaking Vajdahunyad Castle. Other things to do in town include gawking at the architectural eye candy scattered all over the city, hitting up the ​‘Let’s Go’ arcade located in Gozsdu Udvar, ice-skating at the City Park Ice Rink right next to Vajdahunyad Castle and browsing the many vintage clothes and antique fairs that pop up all over the city. Budapest is renowned for its vibrant nightlife and thus it’s no surprise that most of the local haunts are open until the small hours of the morning. In short, Hungarians are always down to have a good time and accordingly, great party spots are in abundance in Budapest: from rooftop bars and cellar clubs to the unique ​‘ruin bars’, the city has it all. The latter are more often than not made up of crumbling buildings and outdoor spaces decorated with fairy lights, patio furniture and other quirky decors. Despite Szimpla’s massive popularity with foreign party-goers, this former factory space is definitely a decent starting point for your night out. Still, I would also recommend you visit on Sunday mornings to peruse the weekly farmer’s market that pop up here. Amazing views of the city await at 360 bar. For the best rooftop views, head to ​‘360 bar’. Although touristy, you’ll still find suave Hungarians hanging out here, sipping cocktails from mason jars. Though if it’s cocktails you’re after, you should most certainly visit ​‘WarmUp Rustic’. The bar has no menu – instead, mixologists wait on you and quiz you about your drink preferences to deliver the most personalised and tastiest drink you’ll ever have. Left: Delicious pastry from Lud. Right: Traditional goods from Madal. Visit Stika for delicious breakfast and brunch plates, Espresso Embassy for unforgettable coffee, Lud for cheap and traditional Hungarian cakes, Madal café for an almost meditative coffee experience (plus the best cheesecake you’ll ever eat) and The Sweet for the best peanut butter cookies and macarons around. The laid-back town of Szentendre. While locations such as Gellért Hill and Margaret Island are definitely worth a visit, there are many lesser-known spots around the city, where you might marvel at the region’s natural beauty. I recommend you head to the outskirts of the city instead, further into the Buda hills, and check out Normafa for stunning nature and views of the city. The local town of Szentendre is also just a train ride away and sits right on the Danube river. A perfect spot for a peaceful outing away from the hustle and bustle of urban Budapest. Left: The charming botanical gardens. Right: The streets of Szentendre. Another hidden gem is ELTE Botanikus Kert – a botanical garden featuring tropical greenhouses home to a variety of exotic plants and trees. In the summer, Római Part is a legendary spot to visit as well. The name translates to ​“Roman Riverbank” and the place is a haven for those who love to spend their time lazing around by the river, munching on fried fish and lángos from the vast number of food stands nearby.